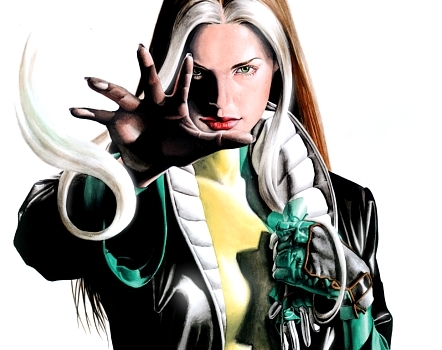 One of the most popular X-Men characters of all time has been Rogue (aka Anna Marie), a young runaway girl from Mississippi who was born as a mutant. She considers her powers of absorbing energy through skin contact, which includes the skills, abilities, powers, memories, and psyche of others, a curse, as they make physical intimacy impossible for her. Throughout the course of her adventures, she passes from exploring her dark, shadow side as a malevolent terrorist while in the Brotherhood of Evil Mutants to claiming her light, good side as a benevolent mutant working on the X-Men team. After absorbing other identities, she holds these various subpersonalities within her (until eventually they are released). The personality that had the major, turning point influence on her and convinced her to leave the Brotherhood was Ms. Marvel (Carol Danvers). After completely absorbing her Kree (alien) powers, she realized the evil of the Brotherhood and sought help from Professor Xavier to control her various personalities. Rogue represents several parts of us—our desire for connection and intimacy, our struggle between light and dark/good and evil, and our efforts to integrate all parts of our personality for wholeness and happiness.